The long awaited branded Guns N’ Roses™ Video Slot by NetEnt on which this game provider has been working on for over a year, is going to be officially released on the 21st of January 2016. 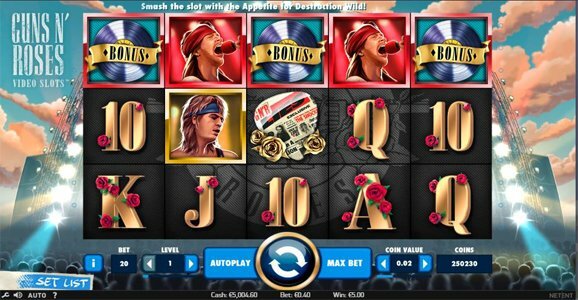 In association with Bravado International Group, NetEnt will release this legendary Video Slot Guns N’ Roses ™ with an incredible amount of game features . The game theme features amazing Guns N’ Roses™ soundtracks, with 5 epic hits for players to choose from, which includes Welcome to the Jungle, Paradise City, Sweet Child O’ Mine, November rain and Chinese Democracy. We are confident that this new Guns N’ Roses Video Slots™ will take you back to the rock atmosphere of a live gig from Guns N’ Roses™ and Welcome you to the Jungle of Rock! This 5-reel, 20-line video slot features Wild substitutions, Expanding Wilds, the Appetite for Destruction Wild, a Bonus Wheel, Bonus symbols, Encore Free Spins, Legend Spins, a Solo multiplier and a Crowd-Pleaser Bonus Game! Players can win up to €75,000 on a single betting line, with a theoretic return to player of 96.98%! Sponsored: Get 50 no deposit casino spins at Casino Room! Check out the online casinos that offers Netent Games! Click here to view the latest Netent Slot bringing to life Jimi Hendrix!